The Tin Machine It's My Life Tour opened on 5 October 1991 after two warm-up shows, one press show and three trade-industry shows. 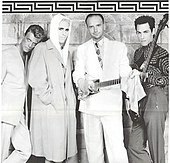 The concert tour itinerary took in twelve countries and sixty-nine performances, a larger outing than the low-key Tin Machine Tour of 1989. The band purposefully booked intimate venues of a few thousand seats or less so that they could focus on the music without any theatrical trappings, a stark change from Bowie's previous Glass Spider and Sound+Vision tours. Bowie also wanted to avoid playing larger venues and arenas lest his fans show up "hoping I'd be doing old songs or something. We don't want that feeling at all." The band rehearsed and warmed up for the tour in Dublin in August 1991. Joined onstage by guitarist Eric Schermerhorn, Tin Machine presented songs from the Tin Machine album and the Tin Machine II album, augmented with cover versions of songs from the Pixies, Neil Young and The Moody Blues. To start the show at some venues, an old TV was placed on stage, playing old sitcoms while the prelude to Wagner's Tristan and Isolde played over loudspeakers. We have no setlist whatsoever. We have a complete list of all our songs on the floor of the stage and we yell it out as we feel it. If you catch us on a bad night, it can be one of the most disastrous shows you've ever seen. But on a good night - and fortunately with this band most nights have been good nights - it really happens. The Hamburg Docks performance on 24 October 1991, was filmed and later released on the video, Oy Vey, Baby: Tin Machine Live at the Docks, with the song "Baby Can Dance" from the same performance appearing on the compilation album Best of Grunge Rock. Songs from the Boston, Chicago, New York City, Sapporo and Tokyo performances were recorded and released on the July 1992 album Tin Machine Live: Oy Vey, Baby. The review of the performance at the trade show at Slim's in San Francisco was not kind: "It's hard to imagine people walking out on a David Bowie show at Slim's, but all you had to do was look around the room Thursday at the end of the appearance by Tin Machine. ... Bowie and his associates gave a more than hour-long display of his latest incarnation, and the music turned out to be nearly unlistenable." The show in Seattle, Washington was met with positive reviews: "Let it first be said that on every level, Tin Machine is an outstanding band. ... [they] may well represent the next evolutionary step in rock and roll - or just another blind alley. In any event, it is powerful stuff." During the show Bowie played alto and baritone sax and electric, acoustic and 12-string guitar. The Los Angeles Times had a positive review of the first New York show, complimenting the band on their desire to tinker with songs' arrangements and appreciating Bowie's "theatrical gift" for performing. This page was last edited on 6 October 2018, at 13:33 (UTC).